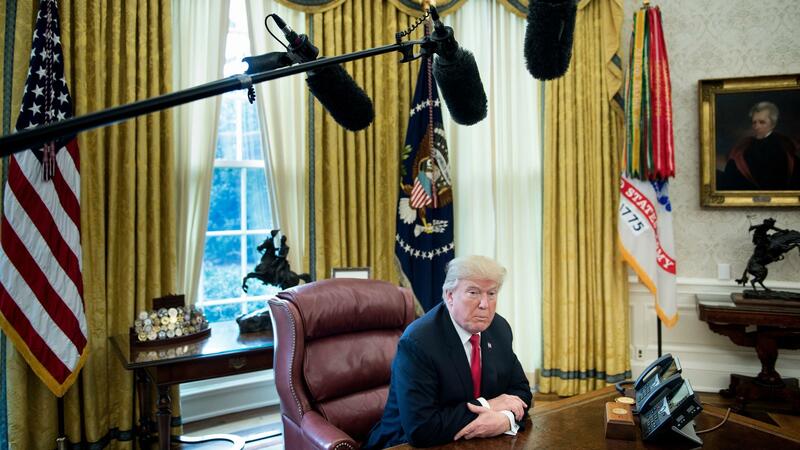 President Trump speaks to the media from the Oval Office on Dec. 22, 2017. "Weird things happen that had never happened to me as a reporter," Miller says. "Several of us started getting cards, actual letters in the mail, thanks from readers from faraway places, notes even on my doorstep at home." Ultimately, Miller's story about Flynn contributed to Flynn's ouster from the administration — a fact Miller says brought him "no pleasure." But, Miller adds, "at the same time, as a reporter, there is nothing better than to be able to get to the bottom of a complex story that there are so many people who are trying to prevent you from getting at." Miller further investigates the links between Russia and the Trump administration in his new book, The Apprentice. That was, sort of, one of the more fascinating and interesting episodes I've ever lived through as a reporter. When we write stories like this, you know, basically accusing a very senior government official of not being honest with the public — and there's a very high bar there before you can publish something like that — you want to have everything locked down. We were ready to publish that story that night. But the strenuous denial, the nature of the denial from him, made us think, OK we we need to double check. We need to we need to hold off and make double sure that we're right on this. So we called the White House, we say, 'We have the denial. We're going to use that on the record. We're going forward with the story anyway. We're confident in our sources.' And then the White House blinks. Flynn blinks, comes back to us, calls me through a spokesman, calls me and says for the first time, 'Mr. Flynn is no longer certain that those sanctions were not discussed in that call. He can't be sure that the subject didn't come up,' and that was just so different from the categorical denial we had gotten, I don't know, 16 [hours] earlier that we knew that we were right. And that's when we published. The stories that we've written over the past two years attributed mainly to anonymous sources have almost all proven over time to be accurate. There might be mistakes at the margins here, news organizations aren't perfect and we do make mistakes, but boy, we've gotten a lot right. ... The Post and other news organizations are always trying to get it right, but at this moment in our history where we are under such attack all the time, and accusations of fake news, there is extraordinary care given to getting the facts and even the nuance exactly right. We don't throw that word around lightly. We often get criticized at The Post for being too reluctant to use that word, and I think that's true in other news organizations as well. But at the same time, I mean, we're here at this moment we have a fact checker at the Washington Post who has documented 5,000 or more falsehoods from this president since he's taken office. Many of them are falsehoods that he repeats despite repeated corrections, public corrections, repeated efforts — even by his own staff — to correct his misstatements. There is an intent. I don't think there's any doubt that there is an intent, that it is part of Trump's very complex personality. It traces back to his origin as a public person. We have run fascinating stories here at The Post about times earlier in his career when he would adopt phony personas and call reporters for Forbes on the phone and try to lobby them into inflating his net worth for the magazine's annual rankings. I just think that's such a bizarre approach. These are these are supposedly public officials. They are our public servants they are not President Trump's public servants. The idea that anybody would be required to sign any kind of loyalty oath to him personally just goes against the grain of so many principles that it's hard to fathom. As I read this memo, I realize [Trump's] talking about me. He's talking about the stories that I had written for The Post. Comey is talking about, 'Yes, I agree with you. Sometimes it's great to put somebody's head on a pike,' as an example. Trump goes on to joke to say he believes a reporter should be put in jail, and jokes about how once a reporter spends a little time in jail they make a new friend suddenly they're willing to talk. It's a really disconcerting moment for anybody in journalism — or anybody who cares about journalism — but for me it was just eerie to think that he's talking specifically about stories I had written for The Washington Post. They're talking about heads on pikes, reporters in jail chasing down sources. It was unnerving. Sam Briger and Mooj Zadie produced and edited the audio of this interview. Bridget Bentz, Molly Seavy-Nesper and Meghan Sullivan adapted it for the Web. This is FRESH AIR. I'm Terry Gross. President Trump has denied Russia interfered in our election or he's equivocated in spite of the evidence presented by American intelligence agencies and journalists. One of the reporters who has broken stories that have revealed new information to the public about that interference and about connections between the Trump campaign and Russia is my guest, Greg Miller. He covers intelligence and national security for The Washington Post. This year, he shared a Pulitzer Prize for National Reporting. Now he's written a new book called "The Apprentice: Trump, Russia And The Subversion Of American Democracy." It's a chronological narrative connecting many of the most important stories on the subject and adding new reporting to those stories. GREG MILLER: Well, I mean, there are several stories. Obviously many stories at The Washington Post broke that I had a hand in one way or another, obviously working very closely with some terrific and amazing colleagues here. I think the one that jumps out for many people is the story that said that former national security adviser Mike Flynn had not been honest about his conversation with Russian Ambassador Sergey Kislyak. We wrote the story saying that he in fact had discussed the lifting of sanctions on Russia in those conversations and then lied about it to the White House, to news organizations, including our own, and to the American public. And this was the sort of - just one of many huge stories that we broke during that time. And a couple others that I was involved in include the revelation that the CIA had reached a secret conclusion that Russia was not just trying to disrupt the election what was - but was trying to help elect Donald Trump. And then later when Trump was in office, I broke several stories about his rough conversations with foreign leaders - we had the transcripts of some of those calls - and the story about his revealing of highly classified information to the Russian foreign minister in the Oval Office. MILLER: Flynn was fired within days, yeah. GROSS: Yeah, so, you know, you helped write the story that Flynn had calls with the Russian ambassador to the U.S., Sergey Kislyak, telling Kislyak that the Trump administration would lift sanctions. So, like, don't worry about it - the sanctions imposed by the Obama administration. And these calls happened after the election but before the inauguration. GROSS: How did you get onto this? How did you start investigating this story? MILLER: Well, you know, so after The Post reported that - about this secret CIA conclusion that Russia had in fact sought to help elect Donald Trump, had - essentially had a candidate in the race and done what it could to propel him to the White House, I mean, it just raised obvious questions about, well, what was Russia doing this for? And was this in any kind of coordination with Donald Trump because of the bizarre things he had said throughout the campaign, including, Russia, if you're listening, could you try to get at those missing Hillary Clinton emails? So these were sort of obvious areas of investigative focus for us at The Post. Flynn was a particular focus because he had become such a prominent figure during the Trump campaign. And there were just sort of lots of - you know, just sort of whispers in Washington about his involvement or his conversations with the Russian ambassador shortly after they happened. Mike Flynn had gone to Russia, raised a lot of eyebrows in national security circles in Washington even before he became affiliated with Trump. He showed up in pictures seated alongside Vladimir Putin at a gala event in Moscow for the RT, the Russian propaganda network. So he already had troubling connections to the Kremlin. And when it was revealed that he had had conversations with the Russian ambassador commensurate right around the same time that the Obama administration was announcing sanctions against Russia, I mean, it just raised obvious questions. What was Flynn telling these people? GROSS: So how did you find out what he was telling them? How do you do that? MILLER: (Laughter) We were digging at that for quite a long time, not getting - not making a whole lot of progress. I had gone to a - an event where Kislyak was speaking even. And he was speaking - he's a physicist by training, of all things. And he was speaking at a conference in Washington. And I showed up and sat down next to him and started peppering him with questions. And he started answering them and sort of caught me off guard. He wouldn't tell me what he'd talked about with Flynn, but he admitted that he had a longstanding relationship with Flynn and had many conversations with him. The thing that I think - one thing that changed the dynamic was a column that David Ignatius, a columnist for The Washington Post, wrote that just posed these questions. We know that Mike Flynn had conversations with the Russian ambassador. We know what - when those occurred. We deserve answers from this new administration about what was said. And that put the White House under some pressure. And it was their answers and their misleading and dishonest answers that then unleashed the sourcing that we needed to get to the bottom of it. GROSS: Did this source come to you? MILLER: Well, so we - what happens is, after that Ignatius column, you have incoming White House officials including Sean Spicer and Vice President Pence going on television and saying, we've talked to Mike Flynn; sanctions were not discussed in those conversations - absolutely not, nothing to it. That's when longstanding sources for reporters at The Post started to hear - started to tell us, not true, not true. You guys need to look into this; that's not true. And it was, you know, through the reporting of my colleagues Adam Entous, Ellen Nakashima and myself in trying to get at that that we ultimately got nine sources telling us consistently that Flynn had in fact discussed sanctions with Kislyak and in fact had signaled that they could expect some relief from those sanctions when Trump was in office. So, you know, there's a scene in the book that I write about in which one of my colleagues, Adam Entous, a terrific national security reporter, is meeting with a source. And he has this certain method about - when he has conversations with sources. He'll often bring a piece of paper that will have a list of facts that he wants to check with that source. And he's going through that list of facts. And in this case, it's about Flynn and Kislyak. And at that moment that he gets the first sort of indication from a highly reliable source that the White House position on this is false, that Flynn's claims that Pence's claims, that Sean Spicer's claims need to be scrutinized further - they're not honest, and that's what sets in motion the sort of really fervent push on our end to get to the bottom of it. GROSS: So your team contacts Flynn to say, we're publishing this story, basically saying that you lied and that you did have phone conversations with the Russian ambassador about lifting sanctions after Trump takes office. And Flynn of course denied it and denied it and denied it. And then you had to decide you're going to publish anyways. You and your editors had to decide. So how was that decision made? MILLER: That was a sort of - one of the more fascinating and interesting episodes I've ever lived through as a reporter. So when we write stories like this, you know, basically accusing a very senior government official of not being honest with the public, I mean, there's a very high bar there before you can publish something like that. You want to have everything locked down. And in fact, in this case, we had a colleague, Karen DeYoung, who had a previously scheduled interview with Flynn in his office in the West Wing of the White House. And so we huddled with her before she went over. She was going to talk to him about the foreign policy objectives of the new administration and so forth - and asked her to at the very end of her interview with him raise this question with him one last time, to tell him, look; The Post is close to publishing a story saying that you did discuss sanctions with Kislyak. How do you respond? In that moment, he doubles down and tells her no, no. And then he repeats it several times - no, no, no, basically did not happen. So Karen comes out of that meeting and calls us and tells us this, and we actually hit pause on the story that night. We were ready to publish that story that night. But the - sort of the strenuous denial, the nature of the denial from him made us think, OK, we (laughter) need to double-check. We need to hold off and just make double-sure that we're right on this. That night, we talked about it in The Post newsroom. The next morning, I went into a meeting with Marty Baron, Cameron Barr, other senior editors at The Washington Post and laid out our sourcing. That's the first time I ever used the word - number nine. I laid - I said, we have nine different sources telling us this is true and described that sourcing to those editors and came out of that meeting with a green light. I mean, when we laid out those details, laid out our sourcing and the efforts we had gone to to try to nail this down, Marty Baron and others were - didn't hesitate, you know? We are going forward with this story. We need to tell Mike Flynn what we're doing. So that sets in motion another interaction with Flynn that was amazing. So we call the White House. We say, we have the denial. We're going to use that on the record. We're going forward with the story anyway. We're confident in our sources. And then the White House blinks. Flynn blinks, comes back to us, calls me - through a spokesman, calls me and says for the first time, Mr. Flynn is no longer certain that those sanctions were not discussed in that call. He can't be sure that the subject didn't come up. And that was just so different from the categorical denial we had gotten - I don't know - 16 hours earlier that we knew that we were - we knew we were right. And that's when we published. GROSS: ...Was a really big thing very, very early in the Trump administration. MILLER: All of the above, Terry. So, sure - absolutely proud of our work, proud that we have been able to accomplish something of such consequence, proud that we were - you know, especially in this climate where the press is under a constant siege and attack, that we were able to do work that still - that mattered and had immediate impact. All of that - I mean, that part of it felt great. I mean, for me, I had actually known Flynn for a long time, probably a decade or so, had interviewed him many times overseas and at the Pentagon and in other positions and always liked him. I took no pleasure in his ouster and his resignation and what came next for him. I mean, that didn't make me happy. But at the same time, just the - yeah, I mean, it was - as a reporter, there is nothing better than to be able to get to the bottom of a complex story that there are so many people who are trying to prevent you from getting out. GROSS: Did you face consequences? Did you get trolled a lot as a result of having unmasked this lie? MILLER: I mean, the troll - absolutely - so trolled a lot, attacked a lot. And that has not really abated (laughter). I mean, that continues now not just for me but for a lot of reporters covering the - this administration at this really highly politically charged time we're living through. On the other hand, weird things happened that had never happened to me as a reporter. Several of us started getting cards, actual letters in the mail, thanks from readers from faraway places, notes on our - even on my doorstep at home. I would walk through the neighborhood, and suddenly people would stop me and thank me. And, I mean, that was - felt great too, and it was odd. It was something I had never experienced. GROSS: Well, let's take a short break here, and then we'll talk some more. If you're just joining us, my guest is Washington Post reporter Greg Miller. He covers intelligence and national security. He's part of the team that shared a Pulitzer this year for national coverage. His new book is called "The Apprentice: Trump, Russia And The Subversion Of American Democracy." We'll be right back. This is FRESH AIR. GROSS: This is FRESH AIR. And if you're just joining us, my guest is Greg Miller, Washington Post reporter who covers intelligence and national security. He shared a Pulitzer Prize this year, and now he's written a new book called "The Apprentice: Trump, Russia And The Subversion Of American Democracy." And it kind of brings together a lot of stories about candidate and President Trump and the Trump administration, stories that have been reported by Miller and other reporters at The Washington Post. Now, you write in the book that Trump has avoided consequences for offenses that were long considered politically fatal, often by lying in the face of overwhelming evidence. Flynn, however, had no such immunity. I was interested that you used the word lying. The word lying when used in the same sentence as Trump (laughter) is very controversial in the journalism world because lying implies intent. You know, a falsehood is when you speak something that isn't true. Lying implies that you know it's not true, and you're saying it anyways. So people are just weighing, is this worthy of using the word lie or not? So you've used the word lie, so I want to ask you about how you decided to use it. MILLER: Yeah. I mean, I feel like it is a difficult decision, and we don't throw that word around lightly. We often get criticized at The Post for being too reluctant to use that word, and I think that's true at other news organizations as well. But at the same time, I mean, we're - here at this moment, are - you know, we have a fact checker at The Washington Post who has documented 5,000 or more falsehoods from this president since he's taken office. Many of them are falsehoods that he repeats despite repeated corrections - public corrections, repeated efforts even by his own staff to correct his misstatements. I mean, there is an intent. I don't think there's any doubt that there is an intent, that it is part of Trump's very complex personality. It's part of - and it traces back to his origin as a public person. I mean, we have run fascinating stories here at The Post about times earlier in his career when he would adopt phony personas and call reporters for Forbes on the phone and try to lobby them into inflating his net worth for the magazine's annual rankings. I mean, there is a - there is an intent here, and I don't have any doubt about that or any hesitation when appropriate from using the word lie. GROSS: After Flynn resigned under pressure, you spoke to Devin Nunes, the Republican chair of the House Intelligence Committee. And you say that what he told you was basically the opening of what became an ongoing siege by Trump and his allies to discredit the FBI. What did he tell you? MILLER: Well, this is at a time when we're trying to figure out - well, we now know that Flynn had discussed sanctions with the Russians, was basically cutting a deal behind his government's back with Moscow. And that just raised lots and lots of questions about, well, who else was in contact with the Kremlin during the campaign, if anyone, right? So there was digging by our news organization and many others. And this was a conversation with the chairman of the House Intelligence Committee, Devin Nunes, who has read into all of the most sensitive intelligence on questions like this. And I was asking him, you know, what else is there? We are seeing lots of indications of contact between Jared Kushner and officials from Moscow and other members of The Trump Organization. We already knew about Paul Manafort of course. And he says that the FBI has been looking at this, and it's all a dead trail. And I pressed him because I could not believe that he was saying that. There was already abundant evidence of contact. Now, you could say that that was incidental and meaningless and harmless, but you couldn't say it didn't exist. But he says, you know, when I press him, not even pizza-boy-delivery contact. And it just struck me at that time that that was so implausible, that he was - you know, he was trying to throw sand in our eyes basically, in my eyes as a reporter. He was trying to protect Trump and that that was more important to him in that conversation than adhering to the facts that had already been established. GROSS: My guest is Greg Miller, who covers intelligence and national security for The Washington Post and has written a new book called "The Apprentice: Trump, Russia And The Subversion Of American Democracy." We'll talk more after a break, and TV critic David Bianculli will consider how the season premieres of "Saturday Night Live" and "60 Minutes" covered last week's Brett Kavanaugh confirmation hearings. I'm Terry Gross, and this is FRESH AIR. GROSS: This is FRESH AIR. I'm Terry Gross back with Greg Miller, who covers intelligence and national security for The Washington Post and is the author of the new book "The Apprentice: Trump, Russia And The Subversion Of American Democracy." Miller has broken several stories about Russian interference in the election and connections between the Trump campaign and Russia. This year, he shared a Pulitzer Prize for National Reporting. When we left off, he told us that when he asked Republican Congressman Devin Nunes, chair of the House Intelligence Committee, about connections between Russia and the Trump campaign, Nunes responded that it was a dead trail, no connections. You've talked about how Devin Nunes, the chair of the House Intelligence Committee, threw sand in your face by basically denying, maybe lying about any connections between the Trump administration and Russia and Russian interference in the election. The question comes up. Why didn't we know more about Russian interference before the election - 'cause the Obama administration knew about it. The intelligence agencies - they were on to what was happening, and the intelligence agencies strongly felt that Russia intended not just to mess with it but to discredit Hillary Clinton. There was a lot of Republican opposition to making any of this public, and a lot of that opposition came from Senate Majority Leader Mitch McConnell. Can you describe the ways he tried to prevent anything from going public about Russian interference? MILLER: There's a long gap between when the U.S. government, through its intelligence services, learns what Russia is doing and when the public finally learns about it. And there's a lot of second guessing, even now, about why the Obama administration didn't tell the public more or earlier. There are scenes in the book I write about in the late August - or the early August time frame, late July time frame, John Brennan, who was CIA director at the time, becoming increasingly concerned about what was happening. The WikiLeaks dump had already occurred. He sort of holes himself up inside his office at CIA headquarters on the seventh floor for two straight days deep into the night each day, poring over all of the agency's Russian intelligence. At the end of this exercise, he's just convinced that Russia - and he has - and he's sitting on new intelligence, in fact, that tells him that the Kremlin is playing a bigger game here than anybody has, to that point, realized, that they're not just in it to try to disrupt the election, but they are trying to help elect Trump and damage Hillary Clinton. And he calls the White House that week, calls him in early August - I need to get in to see the president. After his meeting with Obama, the game plan involves Brennan then trying to reach out to congressional leadership. This is sort of an all-hands-on-deck moment for the U.S. government. They want to make sure the leadership in Congress is aware of what's happening in the election. So Brennan starts calling, you know, the Senate and House leadership, the committee - the leadership of the committee - the relevant committees and so forth and setting up one-on-one briefings with these people. And that's really unusual for a CIA director to do. And he finds, you know, that the Democrats are lining up at his door that - to meet and learn about what's happening. Republicans are putting him off. In fact, he doesn't even get to talk to some of the senior Republicans until almost a month later, sort of the August recess time frame. But nevertheless, this is a - you know, a - an alarming development that some Republicans are showing very little interest in. He finally gets into a conversation, a private meeting, with Mitch McConnell, and we write about this in the book. And Brennan feels like he's coming to these leaders with frightening information, overwhelming information, solid intelligence that shows that Russia has this objective. They're trying to screw in our - screw up the election and trying to install Donald Trump. And in - he ends up in a shouting match with McConnell because McConnell's reaction is something he just - Brennan fails to anticipate and is deeply troubled by. McConnell is saying, well, if you - basically tells him, if you come forward - this administration comes forward and accuses Russia of trying to help and - help elect Donald Trump, I will consider that interference in the election. And I will call the administration out on that. I will accuse the administration of trying to interfere in the election. I mean, it's astonishing. Here's the Senate majority leader being told that Russia is interfering in the election. And he's saying, I'm not willing to issue any kind of statement or take any action that would let the public know that, but I will accuse you of interfering in the election. GROSS: You write Putin had weaponized intelligence. McConnell and the GOP weaponized denial. MILLER: Yeah, because they - because of their refusal to sign on to even any kind of a public statement that would explicitly say, Russia's interfering in this election, Russia is trying to tilt the outcome of this election, the Obama team felt sort of handcuffed. Now, you could argue that they really weren't and that they had lots of ways they could have come forward and talked publicly about it. But the Obama administration is hoping to do this in a bipartisan way, and so determined to do it in a bipartisan way that when Nunez and McConnell and others refuse to go along, they're sort of stuck. They can't see a way past that. It takes them months to figure out a way to get a statement out that, even then, only glancingly gets at the idea that Russia is interfering in the election with a certain purpose. GROSS: ...Signs on to a statement, there's not only no mention of hurting Hillary Clinton and helping Donald Trump, there's no even mention of Russia. It's so vague. MILLER: Oh, it's astonishing to look back. It's astonishing look back on that now because, given what McConnell and others in government knew at that time, that statement is so watered down as to be virtually meaningless. GROSS: So meanwhile, John Brennan - who is trying to convince McConnell, look, Russia's interfering in the election, and McConnell is saying, oh, yeah, if you say that publicly, I'm going to say you're interfering in the election - so Brennan recently lost his security clearance, and McConnell is still the Senate majority leader. I'm wondering - and I don't know if you can answer this at all - but if it can be proven that McConnell knew that Russia was trying to interfere in our election and influence the outcome of it and then tried to cover it up, to deny that it was happening, is that treason? Is that, like, legally treason? MILLER: I don't want to use words like treason. But I write about many cases that are really distressing, that tell us that we're in a different political era than anything we've - that we've seen in this country for a long time, where political imperatives, where loyalty to party or party considerations, seem to overwhelm everything else, including the concern for the country and its core institutions. I mean, what's more core than an election, an election for a president of the United States? What is more deserving of protection and putting above all party considerations than that? And yet, we see numerous cases through this period in which, when senior officials learn about this - and I think Mitch McConnell is one of them - their impulse is to protect their party interests, to try to protect the prospect of a Trump victory over the sanctity of the election itself. I mean, it's a troubling thing. And it didn't always - it wasn't always this way. GROSS: Let me reintroduce you here. If you're just joining us, my guest is Greg Miller. He covers national security and intelligence for The Washington Post. Now he has a new book called "The Apprentice: Trump, Russia And The Subversion Of American Democracy." We're going to take a short break. Then we'll be right back. This is FRESH AIR. GROSS: This is FRESH AIR. And if you're just joining us, my guest is Greg Miller. He covers national security and intelligence for The Washington Post. He shared a Pulitzer Prize this year for National Reporting. Now he has a new book called "The Apprentice: Trump, Russia And The Subversion Of American Democracy." My understanding is that there are members of the Trump administration who have been told that they had to sign nondisclosure agreements, which means that they wouldn't be able to divulge anything to a reporter like you if you called them. And this is an attempt to prevent any kind of damaging information about the Trump administration from getting out to the public. Do you know when somebody you're speaking to has signed a nondisclosure agreement? MILLER: I can't say I've ever encountered somebody who has signed such an agreement. I know that they exist in this White House. I know that they've tried to offer financial inducements to those who would be willing to sign them as they leave the administration and move on. Omarosa comes to mind (laughter). No, and I just think that's such a bizarre approach. These are supposedly public officials. They are our public servants. They are not President Trump's public servants. The idea that anybody would be required to sign any kind of loyalty oath to him personally is - just goes against the grain of so many principles that it's hard to fathom. GROSS: Some people who want to discredit reports about the Trump administration that - reports that expose either, you know, lies, falsehoods, misdeeds say, oh, those stories rely on anonymous sources; I'm not going to trust an anonymous source. So what are your rules? What are your guidelines for using an anonymous source and for how to use them? And also, like, who knows within the editorial hierarchy at The Post who those sources are so they can be confident and do any fact-checking that's necessary? MILLER: So that's a great question, Terry, and it's really - and a really important one at this moment because we do depend on anonymous sources for a lot of the stories we do. And frankly, if we weren't able to use anonymous sources, we would really be unable, I think, to give our readers and the world an accurate picture of what's happening in the U.S. government, inside the Trump administration, inside the CIA or abroad. GROSS: ...Who's telling you the information. MILLER: That's absolutely right. These sources are not anonymous to us. These are sources that we know who they are. Many - in many instances, they're sources we have known for many years and have developed trust in because of how reliably they have given us information. And, you know, frankly, even in that case, when we're writing sensitive stories - I - we talked earlier about the Mike Flynn story and how we ended up having nine separate sources. There's no magic number. Nine was not the magic number we had to get to to be able to go forward with the publication of that story. It could have been two or three. It's more about the caliber of the sources, their positions and whether they have access to the information that they are providing. How trustworthy are they? How much do we know about them? Inside the Washington Post, there are lots of conversations at varying levels of specificity about that sourcing. So sometimes you might be asked, well, what is the position of the - who are - where is the sourcing coming from from this story? Who are we talking about here? And you can basically describe their positions in government. Sometimes if it's highly sensitive, senior editors are going to want to know more. They're going to want you to identify your source. And that - you know, that sometimes can get - that can get touchy depending on the nature of your agreement with source A or source B. But it's something - you know, ultimately, despite all of these accusations and criticisms of our reliance on anonymous sourcing, I mean, the record just sort of holds up. The stories that we've written over the past two years attributed mainly to anonymous sources have almost all proven over time to be accurate. I mean, there might be mistakes at the margins here or there. We're - news organizations aren't perfect, and we do make mistakes, but, boy, we've gotten a lot right. And I know Marty Baron, the executive editor at The Washington Post, talks frequently about - you know, The Post and other news organizations are always trying to get it right, but at this moment in our history where we are under such attack all the time and accusations of fake news, you know, there is extraordinary care given to getting the facts and even the nuance exactly right. It's really - it would really be damaging to not just The Post's credibility and my credibility as a journalist but to the broader journalistic community if - whenever we get things wrong. There's a lot riding on the media right now and its ability to do its job and do it well and do it right. Let me try to give you one more example of the reporting environment that we're trying to operate in, just how much pressure we are under as reporters, how much pressure our sources are under as well. There came a time this past year when the Justice Department and Congress released the memos that former FBI director Jim Comey had kept every time he met with Trump. Every time he meets with Trump, something happens, troubles him, he goes straight to his computer, types up a memo to record what had transpired. One of those talks about a conversation he had with Trump in the Oval Office, and most of the coverage about that memo focused on their interactions about what Trump wanted him to do in terms of backing away from the Flynn investigation. But Trump is also complaining to Comey in that setting about the leaks that are plaguing him at that point early in his administration. He's complaining about, how are people - how are news organizations learning what I'm saying into this phone? And he points to the phone on his desk in the Oval Office. He's complaining about stories. And he's talking - as I read this memo, I realize he's talking about me. He's talking about the stories that I had written for The Post. Comey is talking about, yes, I agree with you. Sometimes it's great to put somebody's head on a pike, as an example. MILLER: Trump goes on to joke about putting - Trump goes on to put - joke about putting - to say he believes reporters should be put in jail and jokes about how once the reporter spends a little time in jail, they make a new friend. Suddenly, they're willing to talk. It's a really disconcerting moment for anybody in journalism or anybody who cares about journalism. But for me, it was just eerie to think that he's talking specifically about stories I had written for The Washington Post. They're talking about heads on pikes, reporters in jail, chasing down sources. It was unnerving. GROSS: Did it make you afraid? MILLER: Well, let me - whether it made me afraid, I don't - I was confident enough in my ability and how I approach sourcing that I wasn't worried about that. I work for a news organization that has my back, and that's a good feeling. But it is frightening in a way, Terry. And I remember talking about this at home when I saw this memo, describing this document to my wife and what was in it. And our 7-year-old was at the table with us. And he heard me talking about it and using words like jail. And he's following this conversation. And I maybe was being too careless as a parent in bringing this subject up in front of him, but he started to cry. He started to get really worried and asked whether I was going to be put in jail. It is frightening. It's - we're just trying to do our jobs. We're just trying to get to the truth. We're trying to fulfill the role that the founders envisioned for the media in this country. And it's an important mission. GROSS: Greg Miller, thank you so much for talking with us and thank you so much for your reporting. GROSS: Greg Miller is the author of the new book "The Apprentice: Trump, Russia And The Subversion Of American Democracy." He covers intelligence and national security for The Washington Post. After we take a short break, TV critic David Bianculli will consider how the season premieres of "Saturday Night Live" and "60 Minutes" covered last week's Kavanaugh confirmation hearings. This is FRESH AIR. (SOUNDBITE OF ANTIBALAS'S "HYPOCRITE") Transcript provided by NPR, Copyright NPR.